Here I want to deal with a debate which comes up before every event or longer run I do. 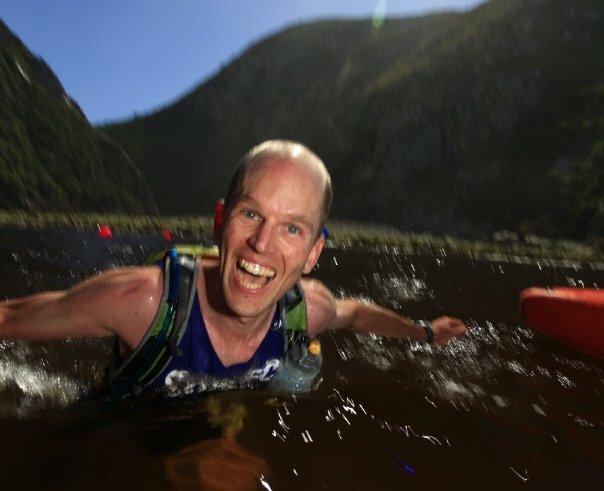 I am only referring to the Otter Trail Run here as a specific example which raised very interesting twists to the thinking.The big question which I discussed with a few runners (Deon “Go-Multi” Braun and Tatum Loftus) prior to running the Otter is: How do we deal with hydration on this run? Large bladder or smaller bottles? Bladder: Can load up to 2 or 3l at a time. The weight is a def negative. Either a pack or bum bag could be options. Bottles: Suggested by the organisers as preferable. Major weight saving while running. The big negative is that we would need to fill up regularly. There was one water point advertised at half way and several others of questionable quality along the way. My personal preference here would be the Nathan Elite 2V Plus. Perfect storage space for the majority of runs with stages up to 2h between refuel points. So do you run heavy (with enough water to get you to 20km and then refill) or do you run light (refill more frequently and deal with purification issues along the way)? You can only really answer this question after you consider your water source from which you will refill en route. I normally advocate running light. This is more natural, far more enjoyable and lets you run faster (thus needing less hydration). Normally I have no problem with drinking from streams but with several informal settlements upstream from our run I was not keen to drink untreated water on this occasion. Here is the crux: How do you treat water in a hurry and potentially fairly often? Chemicals are the obvious choice. Chemicals are just not ideal in my opinion as they do not offer protection against Giardia and Cryptosporidia (the main pathogens which are likely to give problems). I did consider Aqua Salveo which provides protection against several pathogens but not Giardia and Cryptosporidium. Filters or a Steripen seem heavy to carry during a race. However if you weigh them up against the extra water then you come about even if not a bit lighter. Then we have the time required of purifying water. Here we have to guess… less water with more frequent refills (lighter weight and having to stop every 1 to 1,5h to purify). I know that once racing I would be very disinclined to stop and deal with a purifier or filter of any kind. Besides I would not have anywhere to put it in my super light bum bag set up. I did come across a cool looking filter called Life Straw. Basically you drink through this straw which filters as you drink. Sounds good on paper but in reality you then have to drink at each stream and only drink from carried bottles between streams. I intended using Otter as part of my build up run for the Amatola and Skyrun later this year so I thought it would be a good place to run with a pack. This ultimately swung it for me. I filled my bladder with 1,5l of water, threw 2 Zym in and set off. I refilled with the same at halfway. I must admit that the biggest drawback for me was that running with a bag felt significantly warmer than with a bum bag! However I drank way more than I thought I would (may be due to the warm temps or relatively high humidity) and I am not really so keen to deal with gut issues so all of those clinched the deal for me on this one. What I did notice is that quite a few runners had both a bum bag/bottle set up and pack! What is going on here? What are your ideas, thoughts, comments? Next Welcome Mule Bar and Zym! cool pic! interesting discussion – and interesting points about the water on the otter – thanks!